The traditional Siamese is one of the oldest breeds of domestic cats. 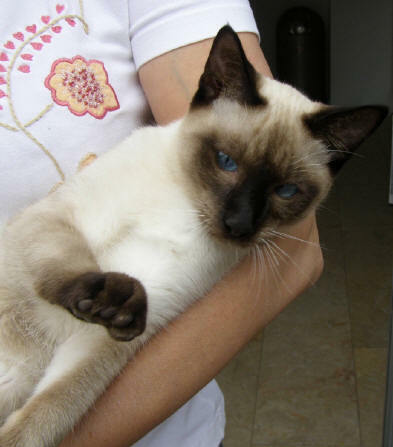 It preserves the look of the breed much as it existed when originally imported from Siam - a muscular, athletic cat brilliant blue eyes and the striking contrast between point and body color which characterizes the breed. They are calm, affectionate cats, In size, they are about what you think of when you think of an average-sized generic cat. Males weight from 11-15 pounds, and females 8-12. 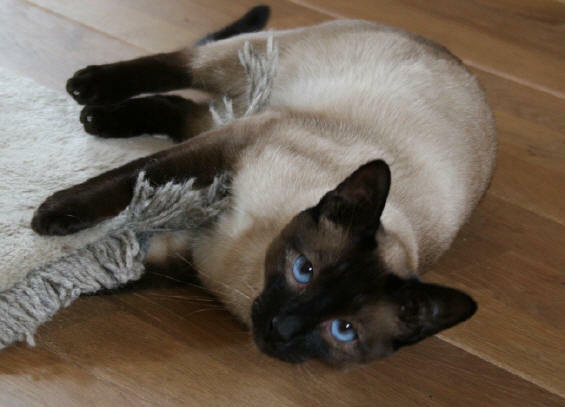 The traditional Siamese is an intelligent, people-oriented cat which enjoys human companionship - whether it be as a lap warmer or chasing a toy. They talk to their people in an affectionate, conversational way. traditional's tend to be less vocal than the modern cats - though some have the harsh "you're killing me" voice, others have a rather quiet meow. Some are non-stop talkers, while others don't talk unless they have something important to say. 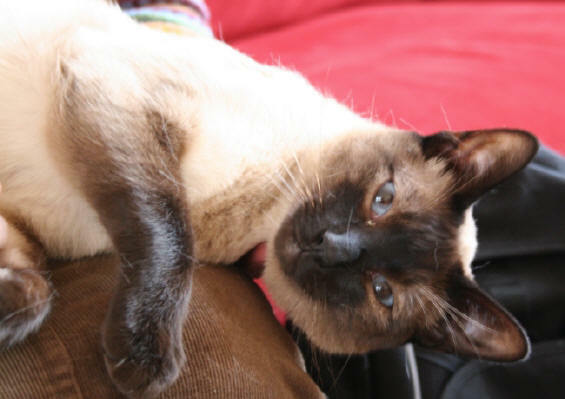 The traditional Siamese demands enough attention and can show his affection intensive to people. They are inquisitive and friendly, and like nothing better than to sit in the middle of something you are trying to read. They have an incredible creativity in tactics and strategies. They can open doors and cabinets and like to throw everything out. More difficult is more fun and what’s ever in their mind, they shall fulfill their thoughts. Every new thing in their surrounding is interesting and a new plant has to be tested. A suitcase means a trip and he likes to go with you. They are inquisitive and friendly, and like nothing better than to sit in the middle of something you are trying to read. From the past is a Siamese known as a “doglike” cat. He retrieves toys and paper balls in the hope you’ll throw it again. He will readily learn to walk on a harness and leash. These behaviors are far more successful if introduced at an early age. He likes trips and is a ideal cat to take with you to your holiday house or boat. A traditional Siamese looks at you strait in your eyes and seems to be understand your thoughts. When you’re sad he is the big consoler. They like the warmth ness of your body and the favorite place is under the sheets for taking a nap. He knows exactly witch food he prefers and hates a dirty litter tree. No other breed can act so swanky. Life is a game. He can jump on your shoulders and lay as a shawl. When you’re looking for he don’t shows himself and when you wants to catch him, he just runs away. With their calm temperaments, they are well-adapted to life in either a house or an apartment. They love people, and most will go right up to strangers and demand to be petted. They have the somewhat perverse nature of most cats, so are sometimes most attracted to people who either don't like cats or are allergic to them. They are good family pets, and are very indulgent of small children - they will tolerate liberties (not to be confused with ill-treatment) from them that they will not take from adults. When they've had enough, they simply make themselves unavailable. Most of them learn to sheathe their claws when playing with people, and it is rare to be scratched. When introduced at an early age, they will usually become friends with dogs or other animals. An adult cat who is already used to dogs is a wonderful "teacher" for puppies entering the home as a pet. When it is necessarily he is brave and not goes away for a dog passing by. Traditional Siamese are not delicate cats, and typically are very healthy with very good appetites. Most breeders recommend a high-quality dry food, and most cats can eat when they like without becoming overweight. Traditional Siamese require very little grooming on the owner's part - the cat is able to keep itself clean and well-groomed. Still, most cats enjoy the sensation of being brushed or combed, and this is a good way to remove excess fur and keep it from ending up on your clothes or your furniture. Traditional Siamese do not shed excessively. Most Siamese cats reach sexual maturity at an early age - it is not uncommon for a female to experience her first heat at the age of 5 months. If neutered at an early age, males generally does not spray.